There's perhaps no other treat as universally appreciated as a lip-smacking serving of ice cream. NYC is packed with plenty of ice cream shops at which to indulge, but if you want to make those calories count, you'd do well to head to one of the very best of them. Here, we dish out the scoop on 10 of the city's most popular ice cream shops, whether its classic cones, heaping sundaes, slurp-worthy milkshakes, or oddball flavors that you're craving. A modern mecca to creative ice cream flavors, Morgenstern’s Finest Ice Cream, on the Lower East Side, comes helmed by pastry chef, restaurateur, and ice cream wiz Nick Morgenstern. Swing by for your pick of more than 30 inventive small-batch ice cream flavors, like tahini caramel, black coconut ash, or blueberry milk chocolate, with plenty more toppings on tap to finish off cup or cone. Plus, there are some half-dozen sorbet flavors, if that's more your frozen treat speed. Bring your appetite (and wallet, at $20 a pop) for the colossal King Kong Banana Split, brimming with bananas, five scoops of ice cream, sesame caramel, pineapple, and, of course, a cherry on top. This Brooklyn-born, family-run ice cream chain marks the spot to be each summer, with an over-the-top menu overflowing with creative and nostalgic flavors. Dig in on one of their signature favorites like Ooey Gooey Butter Cake (vanilla ice cream with butter cake), The Munchies (pretzel-infused ice cream), or Snap Mallow Pop (made with marshmallow ice cream and Rice Krispies clusters). Whatever you choose, rest assured that that scoop comes from wholesome ingredients, including hormone-free and grass-fed dairy, and organic cane sugar with almost everything made in-house from scratch. This mod Lower East Side ice cream parlor grew into a proper brick-and-mortar shop from its hard-earned roots dishing scoops in NYC's outdoor market circuit, thanks to its wow-factor experimental flavors. Known for its handcrafted custom scoops, patrons can choose from ice cream, sorbet, or frozen yogurt. Look out for a changing menu of seasonal flavors, paired with creative standbys like Opium Den (with white sesame, toasted poppy seed, and lemon bread crouton) or Tea Dance (Nilgiri tea leaf, lemon charcoal, and salted caramel). 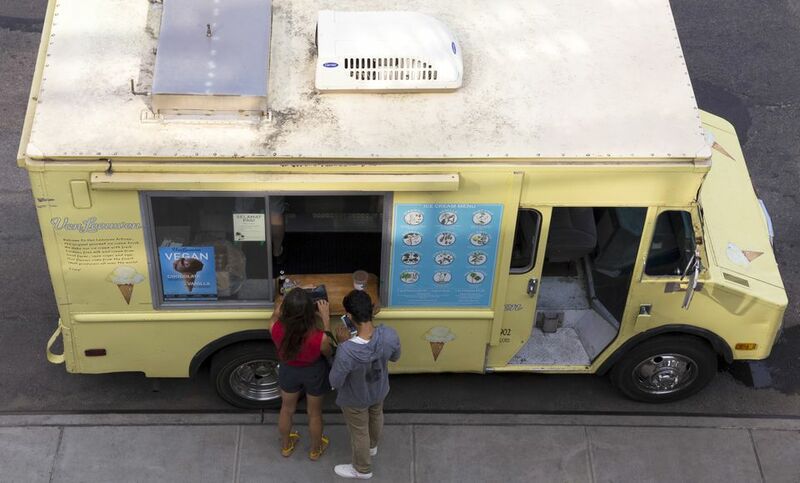 It didn't take long for this leading NYC ice cream purveyor to graduate from its first dip into the industry via a classic ice cream truck back in 2008 (it still sends out old-fashioned trucks for events throughout New York), to the successful chain of parlors that it runs across the city (and beyond) today. With all of their ice cream produced locally out of their Greenpoint, Brooklyn, base, the fresh ingredients have customers coming back again and again. Choose from a rotating roster of special flavors mixed in with a steady stable of Van Leeuwen signatures like honeycomb, salted caramel, and Sicilian pistachio. Dress any of them up with one of the topping-coated sundaes or decadent banana splits, too. Plus, they offer a line of vegan scoops, as well, so everybody has a chance to indulge in their particular brand of frozen goodness. No list of NYC's best frozen treats would be complete without a solid gelato option, and this modern Lower East Side gelateria is one of the best of the bunch. Head to the corner café or walk-up counter for a wide selection of gourmet gelato and sorbet flavors made in small batches on-site in a veritable lab (or, "laboratorio") of flavors. Ingredients are sourced locally and organically, with nearly 200 varieties in Il Laboratorio del Gelato's repertoire, like bourbon pecan, pumpkin, or sweet potato gelato, or cassis or honeydew sorbet. From signatures to seasonal flavors to custom ice cream cakes, the vintage-style Davey's makes ice cream in Downtown and along the Brooklyn waterfront a dream. Expect decadent flavors sourced from local ingredients, with classics like cookies and cream, roasted pistachio, and strong coffee, mixed in with rotating seasonal blends. You can opt to indulge in milkshakes, soda floats, ice cream sandwiches, sundaes, and banana splits, too. The whimsical Williamsburg, Brooklyn, flagship of OddFellows Ice Cream Co. serves up 15 rotating homemade ice cream flavors daily (along with a selection of sundaes and banana splits), which stand out for their namesake "odd" combinations, like buttermilk honey blueberry or chorizo caramel swirl. Also noteworthy is the chain's tiny East Village Sandwich Shop spin-off, featuring up to eight flavors of ice cream, along with a unique menu of ice cream sandwiches, like the OddPocket, a toasted brioche served with ice cream and toppings. Look, too, for a seasonal pop-up soft-serve spot, dubbed Carnival, at the Chef's Club Counter in SoHo, touting soft-serve creations and a carnival theme. One of the city's most lauded bakeries, helmed by pastry whiz Christina Tosi, Milk Bar makes our list for its stellar ice cream, too, thanks to its signature Cereal Milk soft serve. Imagine the milky, bowl-slurping bottom of your bowl of cornflakes whipped into soft serve, a concoction of milk, brown sugar, and a pinch of salt, finished off with a crunchy cornflake topping. They've taken to the same concept with their B'day soft serve, meant to recall birthday layer cake, complete with rainbow sprinkles on top. You'll find plenty of flavorful milkshakes and soda floats on the menu, too. No need to look far for an outpost either, with seven Milk Bar locations spread throughout Manhattan, and another two set across the river in Brooklyn. Transplanted from its Bay Ridge, Brooklyn, roots, this shabby-chic East Village ice cream parlor has been heralded for its quality homemade ice cream for more than 25 years. You'll get all the classic flavors, along with some surprises, too, including interesting Asian-influenced options like wasabi, ginger, or black sesame ice cream on hand. They also have non-fat and sugar-free options, for sweet tooths with dietary restrictions, as well as a fun selection of quirky custom cake ideas. Another success story born of a seasonal ice cream truck (which Big Gay rolled out in 2009), this locals' favorite ice cream venture soon launched a trio of proper ice cream parlors across the city, where customers now line up for their assortment of soft-serve cones, sundaes, and shakes. Ice cream here isn't taken too seriously, with quirky concoctions aimed at kids and kids at heart like Salty Pimp (vanilla ice cream with dark chocolate chunks and dulce de leche) and the fudge-fest that is American Globs (wherein malted sweet cream ice cream meets fudge-covered salted pretzel balls, fudge-covered pretzel pieces, and a fudge swirl). Where Can You Find Brooklyn's Best Coffee Shops?